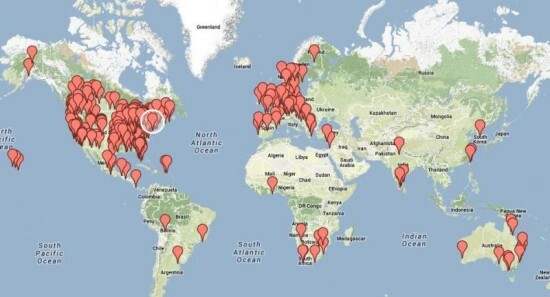 The whole world is marching against Monsanto this weekend. Including San Diego. 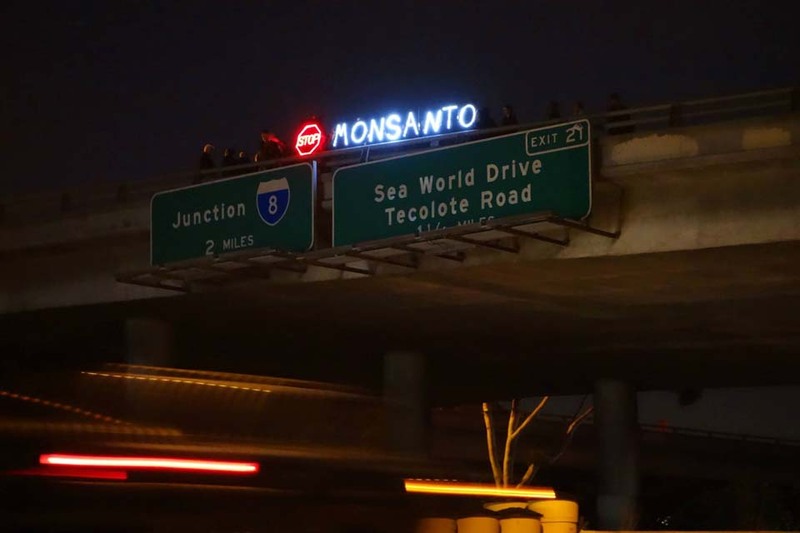 Signage: the Overpass Light Brigade displaying “Stop Monsanto” signage at the Clairemont Drive overpass of I-5 starting at 7:30pm that evening. 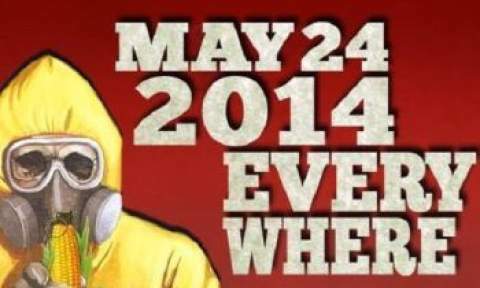 The world will once again come together on May 24 to March Against Monsanto. As demonstrators are determined to permanently boycott genetically modified organisms (GMO) and other agro-chemicals, events are planned in 400 cities throughout 52 countries on six continents. While in the U.S., solidarity marches will take place in 47 states as millions of activists plan to take a stand against Monsanto. 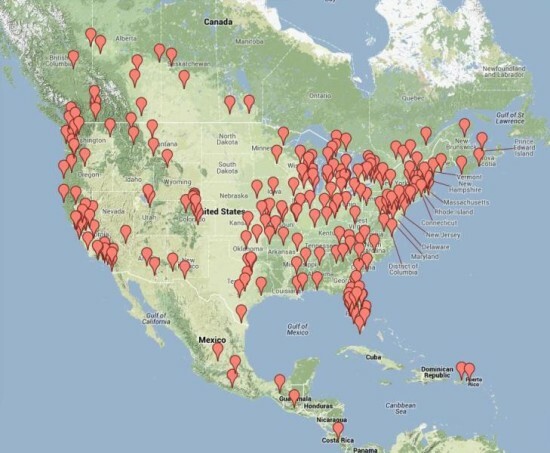 Marches against Monsanto on May 24, 2014, across the planet. Founded by Tami Monroe Canal, March Against Monsanto was an inspired movement to protest her two daughters’ future, according to a March Against Monsanto press release. Actions in North and Central America. 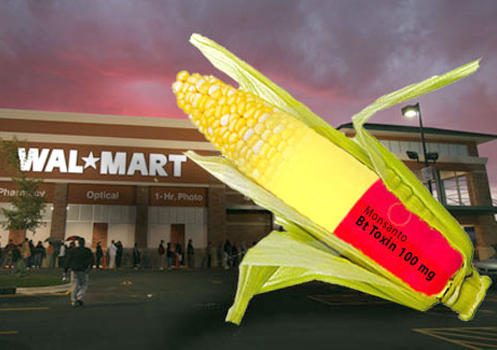 GMOs, which were introduced by Monsanto for human and animal consumption in 2011, not only carry harmful health effects such as organ damage, infertility, auto-immune conditions, allergies and increased cancer risks determined through scientific studies, but also cause environmental set backs including soil infertility, habitat destruction, mono-cropping, loss of biodiversity and is a contributing factor to beehive collapse as proven scientifically. GMO crops are also effecting the “peasant farmers’ livelihood” from cross-pollination with traditional crops. According to the March Against Monsanto’s press release, “in India, more than 250,000 farmers have committed suicide after Monsanto’s Bt cotton seeds did not perform as promised.” Many other farmers in various countries are also going through similar life-changing situations as seed patenting and legal actions on the part of Monsanto and other big-agriculture interested companies are ridding farmers of their rights. While GMOs have been banned partially in Austria, Bulgaria, Germany, Greece, Hungary, Ireland, Japan, Luxembourg, South America, Russia, France, Switzerland and Costa Rico, March Against Monsanto is a movement determined to educate people on about GMOs and fight for a permanent boycott of such crops. And on May 24, the world will make their voices heard in the fight against biotechnology and, instead, strive to make agro-ecology the solution. For a comprehensive list of events and marches, click here.